The Powered Turntable is used when two parallel conveyor lines must be close together with a 180° turn at one (or both) ends. The turning radius is held to a minimum, less than would be available with gravity or powered curve sections. Turntable Plow and Guard Rails insure product safety while negotiating 180° turn. Unit is reversible and all bearings are sealed. Table top speed at drive wheel is 190 FPM. Capacity 500 lbs. Total Distributed Load Maximum Unit Load150 lbs. Motor 1/2 HP 230/460V 3 Ph. 60Hz. The Manually Operated Turntable can be placed in-line with gravity or powered conveyors. 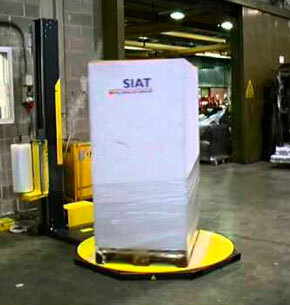 Operator can manually reposition Turntable to divert pallets, product, etc. to an adjacent conveyor line. Minimum elevation to top of rollers is 8 1/2 in. Other elevations up to 40 in. available. 30° Plows are used to divert product from main conveyor line to spur line. Mounts to underside of bed on Powered belt or Live Roller type conveyors. Air Requirements Minimum pressure 60 P.S.I. Maximum 100 P.S.I. free air consumption per cycle 6 in. stroke at 60 P.S.I. (.105 cu. ft.), at 100 P.S.I. (.162 cu. ft.) 10 in. stroke at 60 P.S.I. (.176 cu. ft.), at 100 P.S.I. (.270 cu. ft.). Valve Single solenoid 4-way valve 1/4 in. 20NPT valve ports. Electrical requirements: 120V. 1 Ph. 60 Hz. current draw, .09 amps. INSTALLATION NOTE: To eliminate contaminants in air supply line, a filter, regulator should be installed prior to valve.